Having supported the UNP at the 1956 general election, Lake House faced a daunting task in building relations with the new Prime Minister and Cabinet ministers. On the other hand, the new Government also wanted media publicity for its policies and plans. The Government had to rely mainly on the newspapers to get publicity. Newspapers were published by three privately-owned companies – Associated Newspapers of Ceylon Ltd. (Lake House – Sinhala, English and Tamil), Times of Ceylon (Sinhala and English), and Express Newspapers (Ceylon) Ltd. (Tamil). The radio was State-owned and had just one broadcasting channel. There was no television. In the 1950s apart from the Daily News, Dinamina and Thinakaran (Tamil) morning daily newspapers (Monday to Saturday), Lake House published an afternoon edition of the Observer on weekdays and the Sunday Observer on Sundays. Silumina was the Sinhala Sunday paper. The Thinakaran had a Tamil Sunday edition. The Times of Ceylon published two newspapers – Lankadeepa in the morning and the English paper Times of Ceylon in the afternoon. Both had Sunday editions a well. Express Newspapers published only a Tamil morning daily, Virakesari. The circulation of Sinhala papers were well in excess of the English papers. While more people could read and write Sinhala, there was an increased readership of Sinhala papers because a single copy of a newspaper was read by more than one person and sometimes by more than one family. In the rural areas it was not unusual to hear one person reading the paper at the village boutique to be heard by several others who had dropped in to drink a cup of tea or enjoy a chew of betel. The newspaper reporters were allocated different ministries to gather news. In addition to a few ministries I was given, I volunteered to cover the Ministry of Labour and Housing in my news rounds. Being a labour-friendly Government, it was bound to introduce measures that would benefit the labour sector. Thus the Ministry of Labour was going to be a good news source for the Sinhala newspapers. A Jayatilaka Hall colleague, W.B. Dorakumbura (Dore, as we called him) was the private secretary to the Minister, T.B. Ilangaratne. I had also met the Minister in the university when he dropped in a couple of times to J’ Hall scouting for candidates to contest the election from the SLFP. He knew Dore who hailed from Matale. Nimal Karunatilleka and Dore were roommates and Nimal, who was to do his final exam, decided to quit and contest the election. When he won the Matale seat he was appointed Parliamentary Secretary (as the Deputy Ministers were then called) to the Ministry of Finance. Minister Ilangaratne, who was in the Government clerical service, was an active trade unionist and was President of the Government Clerical Service Union (GCSU). He was dismissed for addressing a meeting of strikers in Kandy in 1947 which triggered off an island-wide strike during which N. Kandswamy, a Government employee, was shot dead by the Police during a demonstration in Colombo. Contesting the Kandy seat in the 1947 general election, he narrowly lost to the veteran politician and UNP Minister George E. de Silva, who got unseated on an election petition. Ilangaratne contested and won the by-election but was unseated. His wife, Tamara, then won the seat. Both contested and won the 1956 election. One of the first decisions made by Minister Ilangaratne was to get Cabinet approval to make 1 May a public holiday. The ‘Labour Day’ was not recognised by the earlier Government although leftist parties and trade unions clamoured that it be made a holiday. He also took steps to extend trade union rights for the public servants. The working hours for all mercantile sector employees were streamlined. The establishment of the Employees’ Provident Fund (EPF) was one of the landmark pieces of legislation that he was responsible for. I remember I got the news first and the Dinamina carried it as the lead story of the day. I did not get a by-line (name of the reporter who writes the news item) since the practice then was not to mention names but to have a line ‘By a Daily News reporter’ or ‘By a Dinamina reporter’ which, looking back, did not mean anything. There were occasions when ‘By a special correspondent’ was used when a particular news story was written by someone outside the news desk. There again the identity was not indicated. 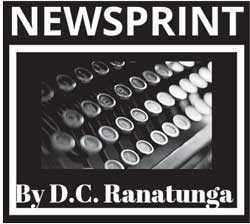 None of the staff members – either bringing news or writing features – were identified. Possibly founder D.R. Wijewardene wanted it that way. He had given instructions that neither his name nor his photograph should appear in any of the Lake House publications. I also covered the newly-created Ministry of Cultural Affairs (including Buddhist Affairs) with Jayaweera Kuruppu, founder member of the SLFP and Member for Ratnapura as minister. N.Q. Dias, a senior member of the Ceylon Civil Service (CCS – prior to the Ceylon Administrative Service), headed the Department of Cultural Affairs. (He was the first civil servant who wore national dress to office.) Another J’Hall mate, Vincent Panditha CCS was Deputy Director and turned out to be good news source. 1956 being the Buddha Jayanthi year commemorating the 2,500th anniversary of the passing away of the Buddha, there was plenty of activity for the newspapers to cover. Special programs were arranged and several heads of state from Asian Buddhist countries came on invitation. Among the early visitors was King Mahendra of Nepal. Of special significance was the visit of the first Prime Minister of independent India, Sri Jawaharlal Nehru. He came with his daughter Indira (who later became Prime Minister herself) in May 1957. 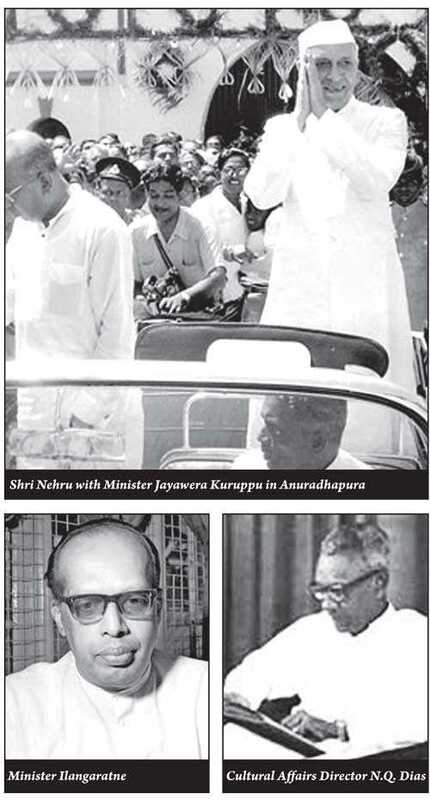 The highlight of his stay was the visit to Anuradhapura the day after he arrived, travelling by special train. Media men also went in the same train. I covered the visit for the Dinamina. The ‘Jayanthi Mawatha’ in the new town was opened by him to mark the Buddha Jayanthi. He also spent time at the Samadhi Buddha statue. 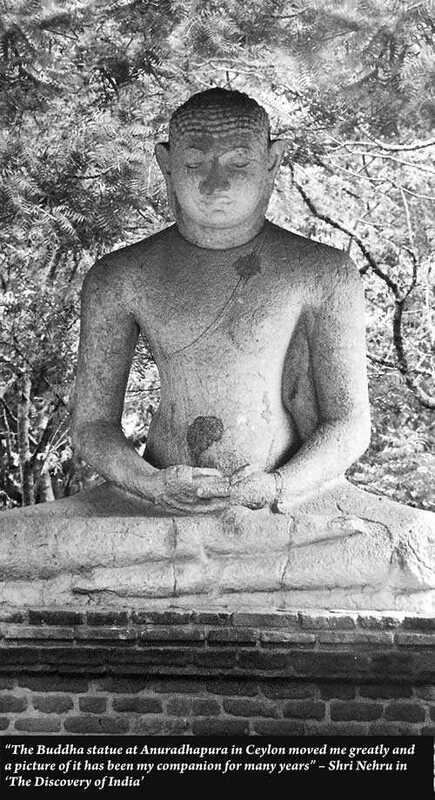 During a previous visit he had spent time all by himself at the Samadhi statue. He kept a replica of the statue which he admitted had brought him solace when he was in prison. In keeping with an election pledge to implement the recommendations of the report released just before the 1956 general election by the All-Ceylon Buddhist Congress calling for the need to elevate the position of Buddhism in the country, the Buddha Sasana Commission was appointed. The sittings of the Commission was good copy for the newspaper and the contact I made with its Secretary, Lakshman de Mel CCS proved most useful. Our association lasted many decades. The Commission report was submitted on 7 July 1959 and was much appreciated by Prime Minister Bandaranaike who pledged to implement its proposals. However, with his assassination in September 1959, the report was set aside. In spite of repeated reminders by the Most Venerable Madihe Pannasiha Mahanayaka Thera and other prelates who knew the value of the report having served as members, it was never implemented.